What is Yoga Nidra? What are the benefits that it offers on physical, emotional and spiritual health? Who should practice Yoga Nidra and Why? Discover the expert answers to all these questions in this article. Yoga Nidra is an ancient tantra meditation technique. In the simplest terms, it means a sleep – that is conscious and full of awareness! It is a sleep in which we do not loose our consciousness. Due to this unique feature of Yoga Nidra, the practitioner experiences a much greater physiological rejuvenation and relaxation as compared to normal sleep. Each human being is a vast storehouse of immense potentialities. But, unfortunately the majority of us do not know how to unlock this hidden treasure lying dormant within us. Yoga Nidra is an effective technique to achieve this and harness the power of our consciousness. Its practice helps to overcome the negativities lying within us. It also helps to cure stress related disorders such as depression, hypertension, digestive problems, asthma, etc. Yoga Nidra is not only helpful in bringing us out of these negative health conditions, but it is also very effective in opening up new capacities of our mind. It gives us the power to understand our mind and come out of our deep rooted conditionings – that are a big cause of the miseries and sufferings in our life. In general sleep that we are accustomed to, we do not unburden ourselves totally. Why? This is because we carry our day to day tensions, frustrations, anxiety, pain and turmoil into our sleep also. This results in a shallow sleep and we are not fully refreshed and rejuvenated when we wake up in the morning. The practice of Yoga Nidra helps us to enter into sleep consciously and keep aside all these mental burdens and tensions. In this way, we get deep sleep and also get rid of old unwanted habits and patterns of our life. In other words, we are born anew! Due to the deep healing effects of Yoga Nidra and its ability to penetrate the subconscious levels of our mind, it holds great potential to cure deep rooted illnesses and bring out the creative genius hidden within each one of us. Through its regular practice, we can channelize the power of our subconscious mind and bring about desired changes in our life. The subconscious mind is among the most powerful forces that exist in our human body. We can harness its potential to reshape our personality and bring about greater positivity and success in our life. 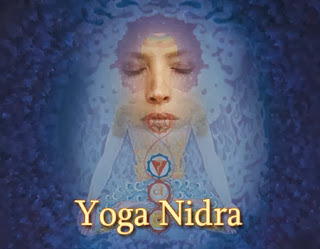 Yog Nidra also helps to release off all types of tensions such as muscular, mental and emotional tensions. It makes us healthy and brings greater joy and blissfulness in life. Yoga Nidra can be practiced by people of all age groups – from young children to aged people. Every individual can enjoy its amazing benefits. It sharpens the concentration levels, so it is very beneficial for students. It fosters good health and improves longevity, so it is beneficial for young and old people alike. Yoga Nidra is best practiced by following a guided meditation muck vedio . One just needs to lie down dormantly and follow the instructions given by the Yoga Nidra Instructor. Although its amazing results and benefits can be experienced right after the first session, a few days of regular practice brings about wonderful results and the desired changes in our personality. No wonder, we can shape our future the way we want to – by the practice of Yoga Nidra! Yoga Nidra “Unwind” is a complete 16 min. training script that can help you relax deeply and touch a place of deep stillness, peace and insight within. Yoga Nidra is an an ancient form of guided meditation that has been proven effective to reduce stress, tension, anxiety, sleeplessness and many other psychological disorders. Yoga Nidra induces the mind to transition from the waking state, through the “hypogonic” state (between waking and dream), into dream and deep sleep states. This transition however is not done unconsciously. Using the tool of Yoga Nidra the transition is done with full consciousness and allows the practitioner to access layers of the subconscious mind will clarity and mindfulness. This allows for the release of many negative patterns in the mind to unravel and ultimately dissolve. Yoga Nidra is deeply nourishing and an essential practice to help us slow down and unwind in the often fast paced modern world.